Text & Photographs By Steve Upperman © All rights reserved. 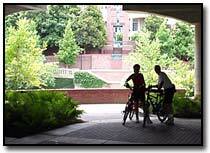 Bicycles are a great way to get around quietly and quickly in an urban area. It is very easy for me to go to a place, get off my bicycle, and take photos. I don't have to worry about parking a car. Taking photos from a bicycle has opened up new areas for me. I get around the hike and bike trails, the short cut routes not open to cars, bridge sidewalks, and parking deck roofs. 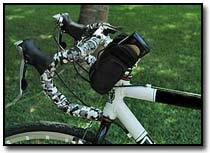 I keep a point and shoot camera in a handlebar bag or the back pocket of my bicycle jersey for easy access. I am ready when an opportunity presents itself or when I am out to take specific pictures. After a little practice, I can get my camera out, take a shot, and put it away while stopped at a light. On a road with no traffic, I can use my camera with one hand while I keep the other one on the handlebar. I take the picture without looking through the viewfinder, just point and shoot. Bicycles are a great way to meet people on the street and take their picture. Sometimes I ask people to take a picture of me on my bicycle. Usually, whoever I talk with will tell me about something cool to photograph nearby. Sometimes I carry a bigger camera, an SLR, in my Camelback. While it is not as spontaneous as a point and shoot, I can still take advantage of traveling by bicycle. Best of all, the bicycle shops I stop in like to hang up my photos of people having fun with bicycles.